There’s just something about a good quote, isn’t there? And when it comes to baby quotes, even more so. I could spend hours scouring the Internet for the perfect quote that will express exactly what I want to say when I somehow can’t find the right words to say it. That’s what I’ve done here. There are so many beautiful, heartwarming quotes about babies out there, but you have to really look to find them. This post however? 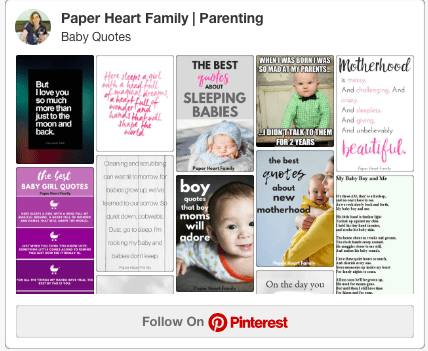 This post is the ONE resource that you need when it comes to finding the perfect baby quote for whatever the occasion. I mean, yes, you probably could spend hours going through all of the quotes that I have here for you, but at least you wouldn’t be searching. They are all here. 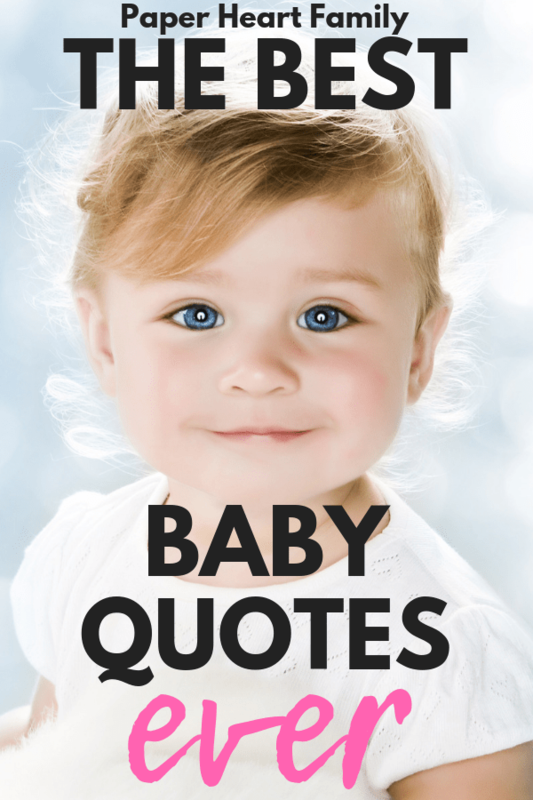 The best baby quotes that I could find, all in one place. I hope these quotes bring you joy, make you smile and bring you peace if you’re struggling. If you’re looking for unborn baby quotes or pregnancy quotes because you’re impatiently awaiting your baby’s arrival, here are my favorites. These new mom quotes perfectly express the incomparable emotions that we feel when we first meet our little babies. Before you were born, we dreamed of you, we imagined you, we prayed for you. Now that you are hear, we hope for you, we love you and we thank God for you. A new baby is like the beginning of all things: wonder, hope a dream of possibilities. Quotes about babies and love that might just have you tearing up and reaching for the tissues. Before you were conceived i wanted you. Before you were born I I loved you. Before you were here for an hour I knew I would do anything for you. As mother to two baby girls, these baby girl quotes are near and dear to my heart, and I read them a lot when I’ve had a frustrating day. They always seem to help me to keep a positive perspective. You are the sun to my shine, the sweet to my heart, cup to my cake, love to my life, sun to my rise, heart to my beat, sweetest little girl. A daughter is a miracle that never ceases to be miraculous, full of beauty and forever beautiful, loving and caring and truly amazing. Rhinestones and pearls, and soft little curls, there’s nothing sweeter than little girls. And because I couldn’t forget about those adorable baby boys, these baby boy quotes make me a little sad that I’ll never have a mama’s boy. There has never been, nor will there ever be, anything quite so special as the love between a mother and her son. A baby boy is so unique, So tiny, sweet and ever meek. It’s fun to imagine what he thinks, between those coos and little blinks. Though now he’s just a babe, you’ll find, that busy is his little mind. Learning, watching, listening, to every single little thing. As you look into his eyes, you see such wonder and surprise He’s just so sweet, and when he smiles, your heart just soars for miles and miles. Tiny fingers and tickly toes, cowboy boots and trucks to tow. A bundle of joy, created by love, a precious gift from heaven above. And of course, motherhood is hard, but sometimes those sweet baby quotes (that we LOVE) just don’t cut it. Sometimes we just need some funny baby quotes that are raw and honest and just plain funny. I had a bunch of baby nursery wall quotes in my babies nurseries, and these are the best options out there. Short, sweet, and totally precious. If you’re looking for baby loss quotes, then I truly hope that these quotes bring a little comfort to your breaking heart, dear mama. I fell in love with you when you were forming in my womb. Now I carry you in my heart instead of my arms. An angel wrote in the book of life my baby’s date of birth, then whispered as she closed the book, “too beautiful for Earth”. I would love to know why you’re searching for baby sleep quotes. Is it because you just can’t stop marveling at the perfect miraculousness that is your baby when she’s sleeping? Or maybe you just can’t believe that your baby hates sleep so much, and your looking for some funny baby sleep quotes. I think I would fall into both categories. Let her sleep on your shoulder, rejoice in her happy smile, she is only a little girl, for such a little while. If you’re looking for when baby is born quotes, then congratulations! Someday you’ll wish that you could go back to that moment, pain and all. On the night you were born, the moon smiled with such wonder that the stars peeked in to see you and the night wind whispered “life will never be the same”. And then my soul saw you and it kind of went, “Oh there you are, I’ve been looking for you”. What bigger moment in your baby’s life then those timid first steps. These baby quotes about walking express just how special this milestone is. Each step you take reveals a new horizon. You have taken the first step today. Now I challenge you to take another. Baby steps… to big dreams. The first steps a baby takes are into your heart. Fear not, little one. The first leap is scary, but it’s how you learn to fly. Step one: read these cute and funny baby movie quotes. Step two: go watch these movies. The perfect baptism quotes for baby that you can incorporate into the ceremony and festivities. Precious one, so small, so sweet, dancing in on angel feet. Straight from heaven’s brightest star, what a miracle you are. Ah, baby feet. Is there anything cuter? All you have to do to wake up your guests at your baby shower is hold up some baby socks. Cue the oohs and aahs. If your creating a keepsake with your baby’s footprint, these baby footprint quotes are the perfect accompaniment. For a long time there were only your footprints and laughter in our dreams and even from such small things, we knew we could not wait to love you forever. Baby feet tiptoe into your heart and stay there forever. If you have been blessed with twin babies, then these twin baby quotes are perfect for you. Two cute little faces with matching grins, nothing could be any sweeter than twins. What are your favorite baby quotes?